Spring has sprung here in the Bay Area, and window cleaning is on the move once again. 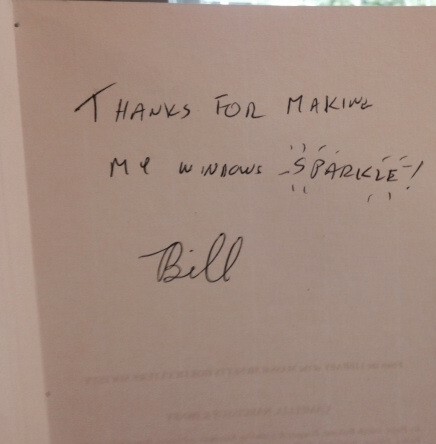 We here at A-1 The Clear Choice sure are happy about that, and we were delighted to receive this lovely card and hand-written note recently from one of our spring window cleaning clients. Despite the unusually dry winter, people are creatures of habit and have been holding out til the warmer months for clean windows. But we can’t complain. It’s par for the course in the window washing industry. And we enjoy having a little down time every year, since the other three seasons keep us constantly on our toes! That’s a pretty impressive list! Please browse around our new site and let us know what you think. We’d love to hear from you. We’ll be posting more pictures and anecdotes of our work here in the coming weeks. So come back and visit soon! Until then, don’t forget to stop and smell the spring roses.